Lely Resort is more than just a community. It is a census-designated place located to the southeast of Naples in the Naples-Marco Island Metropolitan Statistical Area. The 5.3 square mile Lely Resort community is renowned for its resort-style atmosphere, including the world-class Players Club & Spa. The Players Club is considered the singular, most outstanding member club in Southwest Florida. Membership is a requirement for home ownership at Lely Resort. This top-tier facility will amaze you with its attention to detail. When you dreamt of Florida up north, you dreamt of Lely Resort. Everything about it, right down to the smell of the flowers, is a part of a lifestyle you probably have waited too long to seize. It's affordable, too. Browse the listings below and feel free to contact us with questions. We're always ready to help. Lely Resort Real Estate For Sale - Updated Every 15 Minutes! Single-family and estate homes are located in 25 different neighborhoods. Ashton Place, Caldecott, Chatham Pointe, and Cordoba are single-entrance, gated neighborhoods with two and three bedroom homes averaging about 2,000 square feet. The two and three bedroom homes in Calumet Reserve are slightly smaller, with the three-bedroom plus den homes just under 2,000 square feet. The 36 homes in Chatham Pointe are known for their picturesque views. The Cipriani neighborhood consists of luxury coach homes ranging from 2,280 to just over 2,900 square feet and are available in four different floor plans. The 135 homes in Masters Reserve were built between 2003 and 2005 and feature three-bedroom, two bath layouts between 1,672 and 2,072 square feet. Moorgate Point homes are available in four different floor plans with either two or three bedrooms within 1,885 to 2,195 square feet of living area. Homes in Prestwick Place range from 1.700 to 2.100 square feet. Each has three bedrooms and two baths. Cottesmore has 57 luxury single-family homes, all built between 2008 and 2010. Five different floor plans, including three and four bedroom layouts, are available from 2,225 to 2,668 square feet. Sussex place features 20 homes that are similar in size, available with three bedrooms in a variety of floor plans. Homes in Classics Plantation Estate line the Gary Player-designed course. Floor plans range from just under 3,000 square feet to more than 5,000 square feet. Palomino Village also lines The Mustang. Its cozy 1,450 square foot villas are all two-bedroom, two baths with a den. The Ole neighborhood is distinguished by its 20,000 square foot Village Center that provides residents with amenities including an ice cream parlor. The Majors neighborhood has 142 Mediterranean and courtyard-style homes with ten unique floor plans that have living areas from 2,400 to nearly 4,000 square feet. Majors is situated along the Lee Trevino-designed course. These three and four bedroom homes were built between 2004 and 2007. Tiger Island Estates complement the Majors, also having 142 homes ranging in size from 1,700 to more than 4,000 square feet in three and four bedroom styles. Similarly, the Lakoya neighborhood homes range from 1,882 to about 4,000 square feet. Indian Wells is an enclave of single-family golf villas. Other neighborhoods include Chase Preserve, Covington Place, Falcons Glen, Lely Island Estates, Martinique, Pinnacle Cove, and Sunstone on the Fairways. The two and three-bedroom coach homes in Alden Woods range in size from 1.657 to 2,040 square feet under air. Each has an attached garage and paver drive and walkways. The neighborhood has a private pool and spa. The Verandas are two-bedroom, two-bathroom homes with detached garage. These homes built in the mid-1990s come in a variety of floor plans ranging from 1,400 to 1,650 square feet of living space. This densely-treed neighborhood on Panther Trail and Tiger Cove has a private, resort-style pool and a tennis court. Flamingo Fairways condos range from 1,480 to 1,640 square feet and come with two and three-bedroom floor plans and attached garages. Mystic Greens is a gated community with 96 condos and coach homes ranging in size from 1,400 to 2,400 square feet. Units feature either two bedrooms plus den or three bedrooms plus den. The luxurious clubhouse, pool, and spa overlook a tranquil lake. The Greenlinks community was built next to Flamingo Fairways in 2001. Condos are available with either one, two, or three bedrooms. Homeowners in Greenlinks are required to have a golf membership in the Greenlinks Golf Club. Greenlinks homeowners may rent their condos without restrictions for periods of less than six months. Players Cove is located across Grand Lely Drive from the elegant Players Club & Spa with its two lovely pools and 12 tennis courts. Players Cove is home to 96 lakeside coach homes within 24 buildings. Two, three, and four-bedroom plans with attached garage are available in sizes ranging from 2,041 to 2,743 square feet. Twelve Oaks is an intimate neighborhood of 52 two-bedroom, two-bathroom homes with two private, neighborhood tennis courts and a neighborhood pool. The Saratoga neighborhood is home to 98 condo units available in first or second-floor options. First-floor condos are two-bedroom, two-bathroom designs with 1,350 square feet of living space and an attached one-car garage. Second-floor units are 2,498 square feet in size. All are three-bedroom, three-bathroom designs and each has a two-car garage. Similar to Saratoga, the Ascot neighborhood has 84 coach homes with 1,632 square foot two-bedroom plus den condos on the first floor and 2,040 square foot three-bedroom, two-bathroom homes on the second floor. Second floor units come with a single-car garage while the first floor units have the added feature of a two-car garage. Legacy is a neighborhood of 88 coach homes ranging in size from a spacious 2,160 to 2,600 square feet. The Pinehurst model has two bedrooms and two baths plus den. The Pebble Beach is available in either three or four bedrooms. All Legacy homes have attached, two-car garages. The Champions neighborhood has 60 homes with the Pinehurst and Pebble Beach models. The 64 condos in Coral Falls are in three four-story buildings along a dense preserve. A beautiful pool and spa and a collection of chickee huts lie between the preserve and the Coal Falls condos. Hawthorne, Hidden Sanctuary Village, and Mustang Villas round out the condo neighborhoods in Lely Resort, where this is a home that fits the particular needs of any home buyer. Lely Resort is located between Central Naples and Marco Island. In fifteen minutes, you can be in the heart of Downtown Naples, enjoying the fine cafes of 5th Avenue. Ten minutes in the other direction and you're on Marco Island, a super destination for boating or just grabbing a burger at Snook Inn. Lely Resort occupies 2,900 acres south of Naples, bordered by Tamiami Trail (US 41) on the west and Collier Boulevard on the east. With three championship courses, Lely Resort is a golfer’s dream. The Flamingo Island course, a Robert Trent Jones design, and the Lee Trevino-designed Mustang are open to the public. The Classic was designed by Gary Player and requires membership. Lely Resort is about more than golf. It is about living in Southwest Florida. 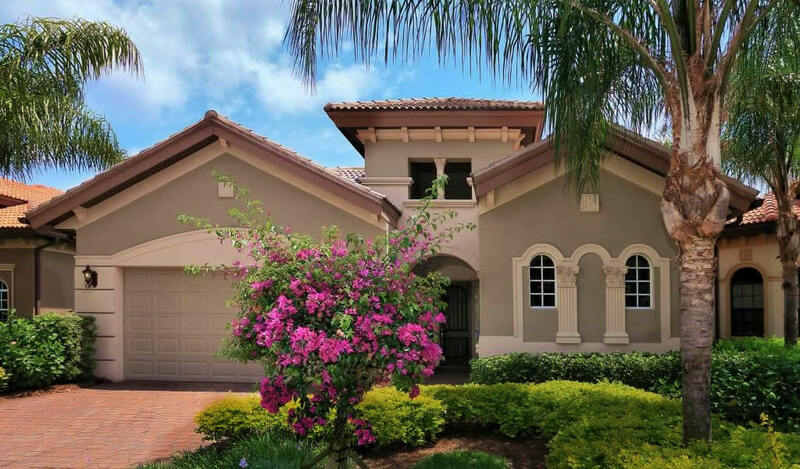 There are many choices in Lely Resort, from cozy condos to elegant estate homes distributed throughout 25 neighborhoods of resort homes and 15 neighborhoods of resort condos. The amenities at the Players Club are unparalleled. The main pool is styled like a lagoon, replete with a grotto-like waterfall. Even the lap pool has a free-form style that sets it apart from others of its type. Shaded cabanas grace the expansive pool deck. There is even a sand beach. And a dog park. For tennis players, Lely Resort features a pro shop and a dozen Har-Tru courts. There is also a stadium court, Bocce courts, and a half basketball court. Personal trainers are on staff at the fitness center. The spa offers professional facials and skin care treatments, massages, and manicures and pedicures. The Players Club offers several dining options, each of which emphasizes elegance and impeccable service. Choose from the Dining Room, the Courtside Café, the Grill, the Terrace, or the Verandah. A poolside Tiki Bar and a private dining room round out the choices for Lely Resort residents and guests.